We want films that shake us up. That pulls us out of our slumber and knocks us into the modern era. Persepolis, an outstanding comic-book adaptation combining documentary and animation together, managed to achieve this. Causing demonstrations, banning and censorship in many places across the world, it is important to appreciate the criticism the film met with. From our perspective, the countless nods it achieved in end of year lists of 2007, awards nominations (including the Academy Awards) and festivals gives the impression that it bypassed such stern opposition. But it didn’t. Despite its personal depiction of a girl growing into a woman, Persepolis is a film that jumped from the screen and fought. It challenged views and caused disruption. Isn’t this what the best films do? Marjane Satrapi is the woman waiting at the airport. In colour, she awaits a flight at Paris-Orly to go home to Iran. Her mind wanders back to monochrome-memories of Tehran and the family she misses so much. Her childhood is a mix of protests and inspirational talks with her uncle, Anoush (combined with a love of Bruce Lee and, in time, Iron Maiden). We see the changes in her world as Islamic Fundamentalists succeed in gaining 99% of the vote, and force strict expectations on the populace. This includes all women wearing headscarves and a no-tolerance attitude towards alcohol. Marj’s middle-class parents, Tadji and Ebi, seek a better life and send her to Austria for schooling. She meets punk-fan friends and falls in, and out, of love, before returning to Tehran and experiencing the regime as an adult, whereby Art classes are conducted with Botticelli’s Birth of Venus censored and a life-model covered from head-to-toe, leaving only the head poking out. We wonder whether Marj will stay. And how this all leads back to her colourful days in a Parisian airport. 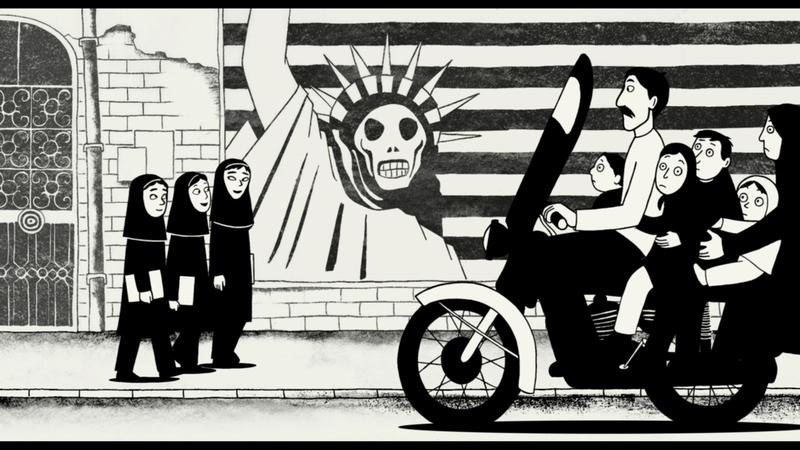 Persepolis preceded the Oscar-nominated foreign-film Waltz with Bashir in 2008, and joins the ranks of international animated films that weave complex politics into digestible cartoon stories. There is always a worry that cinema can dilute, or take away from the seriousness and severity of situations abroad. Instead, Persepolis ensures that we access the story comfortably. The comedic flavour of the animation slips us into the era in a way that we can relate to. Her Guernica-chin jutting out as her body changes shape, or the change of animation as she recalls her relationship with a scumbag cheater, is something we understand. It isn’t too far to relate to the parties and risky games played, as Marj enjoys her younger years. Suddenly, a conflict that was almost exclusively on television screens, in unclear footage and news bulletins, becomes relatable and true to westerners. Directed by Marjane Satrapi herself and Vincent Paronnaud (an artist who uses the pseudonym Winshluss), Persepolis is a triumph, succeeding in using the comic-book art-form to engage. At one moment, Marj tells a friend that she is from France – a momentary lapse in judgement that is regretted as soon as her Grandmother appears to chastise her. Satrapi has not only proudly stood by her roots, with a clear love for her homeland and its history, but she makes it a world that is full of beauty and character. 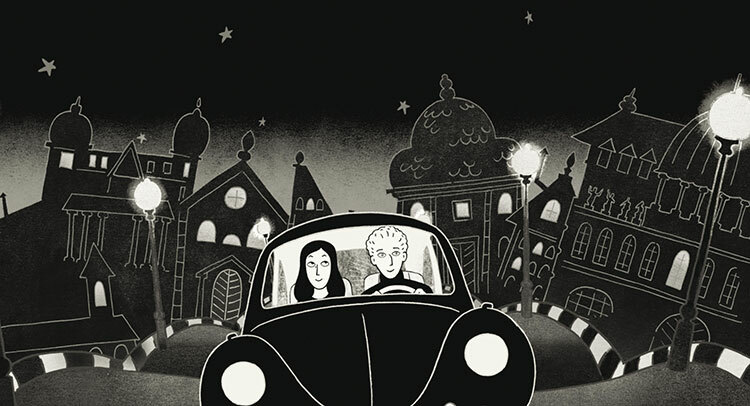 Yes, Persepolis criticises the strict regime and expectations on women in Iran. But it is framed from the perspective of a woman who wants to desperately be part of a country that won’t accept her existence. More of love-letter to a time that won’t be forgotten, Persepolis is a story of brutal, heartfelt honesty and it’ll linger long after your first viewing.